Listeners create a playlist inspired by surprise Glastonbury Festival headliners Metallica. 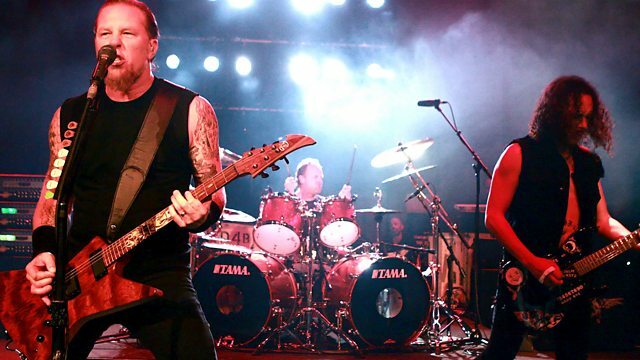 With the big news this week that Metallica have been confirmed as the final headline act for this year's Glastonbury Festival, Tom Robinson invites 6 Music listeners to create a playlist inspired by the metal veterans. The online world has been in hot debate since it was announced that James Hetfield, Lars Ulrich and Co. will top the bill on the Pyramid stage on Saturday 28 June. They complete the main stage trinity that sees Arcade Fire headlining on the Friday, with Kasabian bringing the festival in Somerset to a close on the Sunday. Since forming in 1981, Metallica have become one of the biggest bands in heavy metal, with hits including Enter Sandman and Nothing Else Matters. The last big Glastonbury booking to cause such debate was in 2008 when Jay Z was became the first rapper to headline the event. So in honour of the news, Now Playing want your suggestions for a Metallica themed playlist, which could feature tracks by the band, collaborators such as Lou Reed, bands they've influenced, other unexpected festival bookings or any other interesting musical connection to the band you can come up with. Song suggestions and comments are invited via the hashtag #Metallica6Music on Twitter as well as through the 6 Music and Now Playing Facebook pages, collaborative playlists on Spotify and Rdio and the usual other contact methods. The Best Of Phil Lynott & Thin Lizzy.